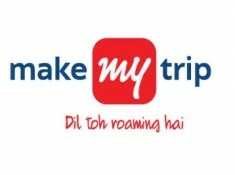 MakeMyTrip Running An Offer on Domestic And International Flights on Indigo Sale , They Giving Low Cost Of Domestic And International Flights Starts From Just Rs.899. This offer is valid on select sectors and select flights only. 15 Days advance purchase required. MakeMyTrip & Indigo reserves the right to cancel / modify / substitute / alter any aspect of this offer either partly or entirely, at its sole discretion without reason or prior notice. This cannot be clubbed with any other on-going or any new promotional offer. Offer provides the normal Indigo baggage allowance. Any additional baggage allowance will be charged as per the normal baggage policy. MakeMyTrip & Indigo is not responsible for any delay for any reasons beyond its control. Top Travel Offers:- Book Your Flight & Get Big Discount & Cashbacks! !